Who Are Greenleaf & Why Are Their Dollhouse Kits So Popular? Dollhouses are steeped in ancient tradition. They have always made great holiday gifts for both hobbyists and young ones alike ever since they were created. 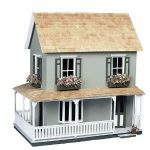 A Greenleaf wooden dollhouse kit is perfect for the following reasons- it’s an outstanding family project, a worthy family keepsake and an excellent addition to any collector’s trophy shelf. Dollhouses are usually limited to one per child in a household, so it’s important to choose the best one. The right dollhouse is sure to provide many, many years of enjoyment. It will quickly become one of the most cherished possessions your children will have. 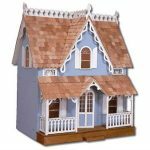 Greenleaf is the one brand you should consider when shopping for wooden dollhouses, as they have been around for more than 70 years. Chances are, you will have that special gift which makes any occasion memorable if you choose them. Greenleaf has a longstanding pedigree that shows off a range of classic and innovative design. The brand has garnered worldwide recognition in among hobby associations, dollhouse design institutions and miniature collector organizations. Perhaps the best part about Greenleaf is the number of positive reviews it has received from delighted customers. One of their missions is to provide affordable miniature collectibles and dollhouses for children and hobbyists, with quality that is made for royalty. With all the other dollhouse brands out in the market, what makes Greenleaf stand out from the rest? The answer isn’t just limited to one. 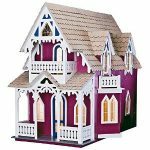 There’s exceptional wooden dollhouse construction quality, a huge, diverse selection of available dollhouses and dollhouse furniture, outstanding design and of course, affordability. Greenleaf has made dollhouses for more than 50 years (and counting) and has established itself as one of the leading authorities in the miniatures industry. All craft kits and houses come with simple illustrations and clear instructions. You won’t need any extra tool or nails to build them. There’s a Satisfaction Guarantee for every dollhouse they offer. 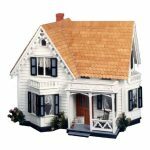 Major retailers carry Greenleaf Dollhouses because of the product prestige it brings. The brand is simply the largest wooden dollhouse and miniatures company around the world. 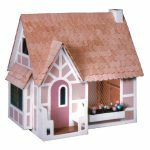 Just how popular are Greenleaf dollhouses? You can see them being sold in hobby shops and toy stores in the United States, Canada, Europe, Australia and Japan, just to name a few. This miniature Tudor cottage shows off the designer’s impeccable attention to detail in recreating English architecture. 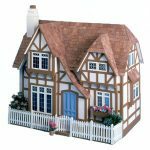 The Glencroft Dollhouse features a half-timbered exterior and a charming picket fence. The mini-house is simply a delight to behold- flower boxes and leaded glass windows made with silk-screen materials. Inside are four cozy rooms, two fireplaces, a couple of window seats, built-in bookcases and a beamed ceiling. Rounding out the English design is a winding staircase that completes the effect. Undeniably grand, the Beacon Hill has gained the title “Flagship Dollhouse” among the Greenleaf selections. The exterior is painstakingly rendered via a curved Mansard roof and little windows located in the cellar room. The Beacon Hill has a total of 7 rooms and two hallways that could double as rooms which could be duly furnished. 3 bay windows, 3 fireplaces and a winding staircase complete this stunning dollhouse. The Arthur is the classic all-time favorite. It’s a must-have for collectors and an excellent first dollhouse for children! You get four ample-sized rooms, a rustic front porch and windows made of silkscreen material. The icing on the cake lies in on the unique gingerbread trim found on the roof and and on the ridges. Anyone who takes a look at Our Westville will pause and see the good old days. It is reminiscent of the old mail order catalogues which came in at the turn of the century, deep in the hamlets of New York’s Westville. It has that Carpenter Gothic style with home features such as porches, roofs and balconies that show off the most elaborate trims and long, pointed gables to accentuate it. There’s a wide attic and 4 apt rooms, and 2 balconies and 2 bay windows. The Little House By The Side Of The Road is made complete with clapboard sidings and decorative shingles. There’s a small community of summer cottages that can be found in the Oak Bluffs town. Inside the Martha’s Vineyard island in Massachusetts, there was once a small cluster of tents which became a characteristic Carpenter Gothic community once the Civil War ended. The tightly-clustered cottages originally measured 11 x 19 feet, with their barge-boards similar to that of tent trims and their fronts decorated with gingerbread. 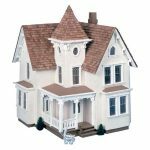 The Vineyard Cottage dollhouse perfectly recreates those striking structures, starting with the lower and upper front porches, a Gothic bay, a staircase, a tiny nook found above, 2 dormers and 2 first floor rooms. Of course, what’s more festive than a gingerbread trim to round out that summer look! The Coventry Cottage follows the same snap-on principles to that of the Storybook, complete with furniture and shingles. The Coventry Cottage is much larger, featuring an L-shaped full attic and 2 downstairs rooms. There are 9 miniature furniture pieces, a clock, 4 picture frames and 2 wall shelves. There’s even a cute hanging swing by the front porch! Gingerbread stylings, a flower box and windows of silk-screened material, there’s absolutely no detail left out in our charming dollhouse. Comes with a tole painting pattern. Let’s get down to the details. The Sugarplum has a chimney, window box, exterior half-timber trimming, a window bay, 2 fireplaces, a full attic, a great room, a front porch replete with settles and six detailed furniture pieces. Here’s the list of furniture – a corner hutch, a bench, one full bed, a table and 2 double settles. It’s beautiful and easy to assemble. The wooden dollhouse also features windows of silk-screened material, wood shingles and detailed cardboard trims. Picture the size of half a place-mat and that’s how you’ll see this 1/2 scale Victorian dollhouse. 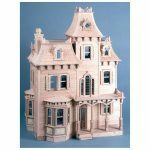 The miniature structure is Victorian in all aspects, including a wraparound porch, 4 fireplaces and even a tower chamber! Everything is in half- the 1/2 scale shingles can be fitted into all 6 rooms. Everything, including the attic, is fully compatible with the Houseworks 1/2 scale components. Once complete, the Fairfield will prove to be an invaluable gem to your collection. They say home is where the heart is. This becomes 100% true when you always have a trailer that you can call your home! 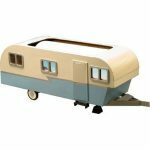 The trailer harks back to times where life was simple and less hectic. In other words, a vintage Americana era. Greenleaf has included a special dowel stick and shelf which is similar to the old hotdog vendors selling food down by the beach. With a little construction and a lot of imagination, you can make the Miniature Travel Trailer a part of your priceless collection. It’s great for train layouts and as a decorative addition to your fireplace mantle or under your festive tree. The Greenleaf Village kit is a wonderful complement to the Christmas Season! Assembling it and painting it will be an unforgettable moment for the kids and collectors alike. When done, you can put it on display or fill the houses with holiday goodies such as candies or small gifts. 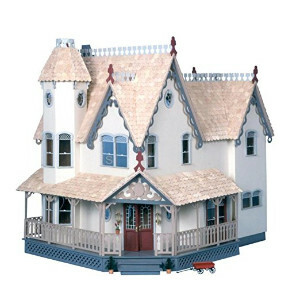 All Greenleaf Dollhouses are made in Schenevus, New York, just right beside the Corona Concepts dollhouse products. Buyers will get more choices as the products come from one location. Each Corona Concept dollhouse is made of 100% wood. It also provides a welcome option for individuals who wish to assemble their dollhouses with the paint already set in. 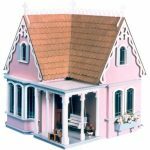 Corona Concept dollhouses are affordable and their style has captured the hearts of children and hobbyists everywhere. 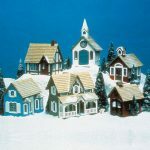 Beginner collectors and the more discerning enthusiast can turn to Greenleaf Dollhouse and Corona Concepts dollhouse for miniature dollhouses that are worth each penny. Both brands are now manufactured under one location and in strict manufacturing standards under New York jurisdiction. Suffice to say, it’s truly an exciting time to start collecting Greenleaf and Corona Concept dollhouses and experience a selection of available products like never before!